Some disagreement among scientists remains about how the Devils Tower formed — whether part of some ancient volcanic system or simply uplifted as an underground intrusion — but there is no question that it formed from molten rock. The specific name for the rock is phonolite porphyry; similar to composition to granite, but lacking quartz. 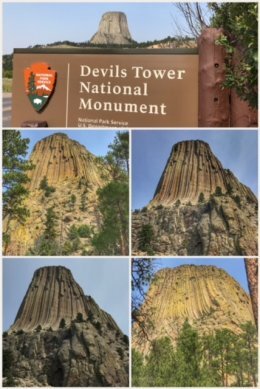 As is our custom, we started our time at Devils Tower (also known as Bear Lodge to Native Americans), at the park’s visitor center. We learned about the three main trails and made plans to hike all three. We made it to two out of the three, but temperatures in the mid-90s kept us from completing the longest one. That said, we did enjoy the Tower Trail, the most popular trail in the park, which is a 1.3 mile paved loop around the base of the tower, offering multiple views and angles. We saw multiple groups of climbers, and it is a pleasant hike through a Ponderosa Pine forest. 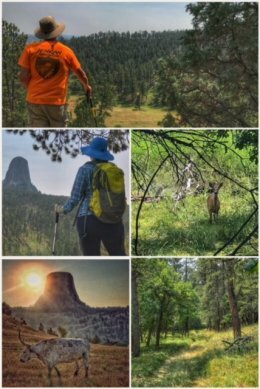 We also hiked the Joyner Ridge Trail, a 1.5 mile loop dirt trail that offers more views of the tower, as well as a journey through forest, ravine, and prairie. The trail we ended up passing on is the Red Beds Trail, which is a larger (2.8-mile) loop around the tower. This national monument is a great place to visit… and besides the tower itself, you’ll get to experience (more) prairie dogs and other wildlife, such as porcupines, wild turkeys, and deer. Next up? 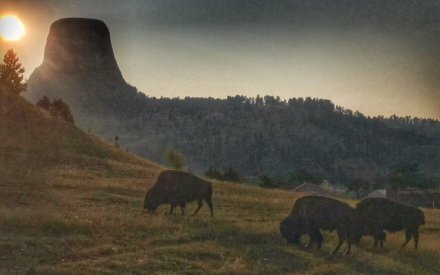 Back to the Black Hills of South Dakota!